Run out of TOSlink inputs on your receiver? This optical to coaxial converter will allow you to connect the TOSlink optical output from your DVD, cable or satellite receiver to a coaxial digital audio input. 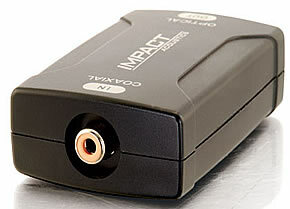 Don't buy a new receiver - simply change media formats and get full digital signal sound quality. 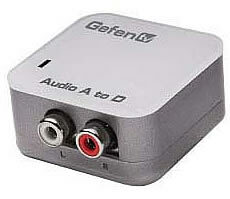 The Digital To Analog Audio converter box takes your coaxial/optical (S/PDIF or TOSLink) digital audio source and converts it to standard analog left/right audio, available for connection to an external device such as an amplifier or recording deck via standard RCA-style jacks. Now you can bridge your legacy sound system with digital sources such as TV's, DVD and CD players that don't have RCA-style analog outputs. 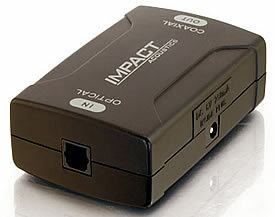 Connect up to three optical sources to the digital/optical input of your home theater system. 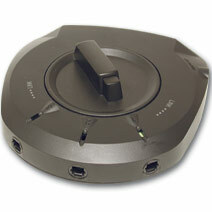 The Toslink Selector features high-integrity toslink jacks for optimal transfer of light signals. This selector will also help with preventing the wear and tear on your toslink cables and I/O jacks that comes from manually connecting and reconnecting cables. And, the unit's space-saving design allows you to place it almost anywhere.